Origin and Habitat: Crassula expansa is a widely distributed species found in South Africa (Eastern Cape, Free State, Gauteng, KwaZulu-Natal, Limpopo, Mpumalanga, Northern Cape, North West, Western Cape). Altitude range: 0-1500 metres above sea level. Habitat: Wet places in short grass, from dry regions of Namaqualand to coastal forest in KwaZulu-Natal. Description: Crassula expansa is a delicate mat-forming perennial or (sometimes) biennial or annual succulent herb, somewhat branched to 6 cm tall and 50 cm in diameter, completely glabrous, with decumbent or rarely scrambling branches sometimes rooting below. The leaves usually not more than 3 mm broad, are linear in outline and flat, tapering towards the acute apex, slightly fused at base, succulent, dark green to purplish. The flowers are minuscule an forms on ,very slender, thread-like pedicels. Stem: Herbaceous, succulent or scarcely woody at base, green to reddish, slender, irregularly dichotomous, much branched, diffuse, glabrous 10-30(-40) cm long or more to 2.5 mm in diameter, leafy throughout; the branches decumbent or rarely scrambling, with or without adventious roots at the nodes. The typical subsp. expansa has decumbent branches with glabrous leaves and no 'stilt' roots. Leaves: Succulent, dark green often shiny, yellowish green to brown or purplish, 2 mm apart, (4-)12-24(-35) mm long, (1-)2-6(-15) mm wide, sessile and partially fused at the base (sheath up to 0.5 mm high), rarely with a petiole to 4 mm long, spreading or recurved, lamina linear-lanceolate in outline or linear-elliptic, elliptic or narrowly spathulate and flat, or rarely nearly terete (Northern Cape forms), mostly acute or subacute, fleshy, upper face flat, convex beneath, margin often reddish with a ring of hydthodes, glabrous or (rarely) hairy, shrinking when dry. Inflorescences: The flowers are mostly solitary in the axils along the upper half of the stem and also in corymbose cymes (a thyrse) at the end of the branches and stem varying from a number of few-flowered cymules to solitary flowers or with flowers fascicled at apex. The flowers appear on a very slender, thread-like pedicel at first barely longer than the flower (6-18 mm long), then elongating up to 40 (55) mm in the fruit. Flowers: 2-4 mm long 5-merous. Calyx 1.25-2.5 mm long, nearly as long as the spreading corolla. Sepals 2-3 mm long, 0.5-0.8 mm broad, oblong or oblong-lanceolate to linear-triangular, blunt, with obtuse interspaces, slightly connate at the base, fleshy, green to brown. Corolla cup-shaped, stellate, 4 x 6 mm in diameter, (1.75-)2-3(-4) mm long, white often tinged red. Petals scarcely fused at base, 2,5-4(-5) mm long,1-1.25 mm broad, elliptic-oblong, linear, subacute, slightly contracted to wards the obtuse, apex, erect or recurved at apices. Filaments 0.75-1.5 mm long; anthers black, 0.25-0.4 mm, subcircular. Styles shortly subulate. Squamae shortly cuneate, transversely oblong to square, 0,3-0,4 x 0,5-0,6 mm, fleshy, pale yellow to orange. Blooming season: This species flowers in mid-summer but also sporadically throughout the year. Fruits: Follicles 1.5-2.5 mm. (with the styles). 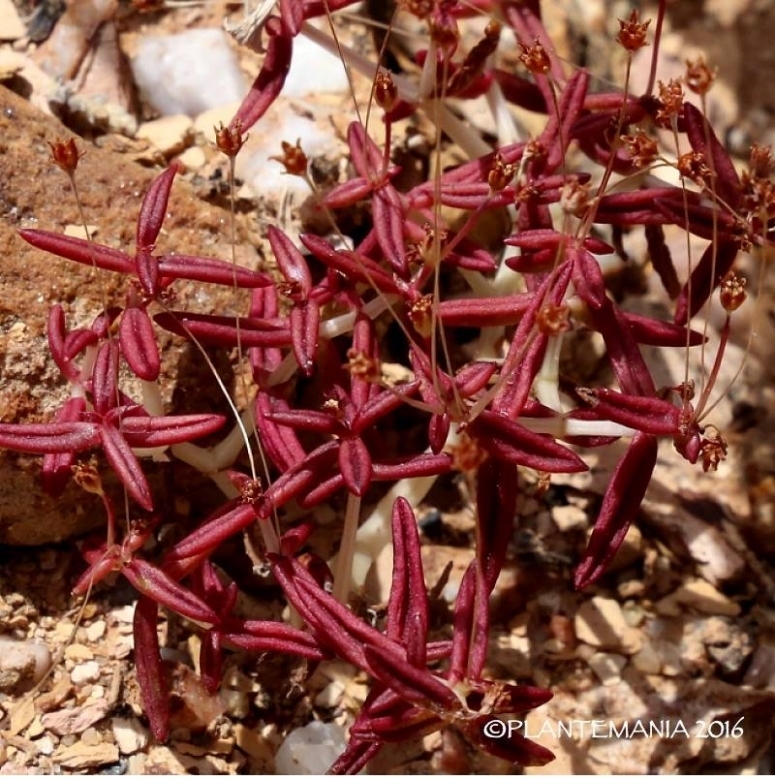 Remarks: Crassula expansa is a very variable taxon with several local forms. The leaves are almost terete in Namaqualand, somewhat flattened in the Little Karoo and adjoining areas, and in the eastern Cape Province they become gradually more flattened and then grade into the form from the Natal coastal hills. An extreme form which often has somewhat larger leaves and similarly large flowers oc­curs on the sandy flats east of the Lebombo Mountains of Natal. Other characters which show a wide range of variation are the length of the pedicel, the colour of the branches and the shape of the infloresence as well as the number of flowers per inflorescence. Crassula expansa Dryand. : The typical subspecies has decumbent branches with glabrous leaves and no 'stilt' roots. Distribution: Dry regions of Namaqualand to coastal forest in KwaZulu-Natal. Crassula expansa subs. filicaulis (Haw.) Toelken: is slightly woody with glabrous leaves and develops 'stilt' roots. Distribution: coastal dunes from Port Alfred in the eastern Cape to the Cape Peninsula. Crassula expansa subs. fragilis (Baker) Toelken: has hairy or glabrous leaves, with hydathodes scattered on the upper surface. Distribution: Angola, Mozambique, Zambia, Zimbabwe, Swaziland, Mpumalanga, KwaZulu-Natal and Eastern Cape, South Africa, and Madagascar. Crassula expansa subs. pyrifolia (Compton) Toelken: has glabrous leaves with hydathodes scattered over the entire surface, flowers in terminal clusters. Distrbution: sand in the coastal belt from Namaqualand to south-western Namibia. 7) African Plant Database (version 3.4.0). Conservatoire et Jardin botaniques de la Ville de Genève and South African National Biodiversity Institute, Pretoria, "Retrieved [set month and year]", from <http://www.ville-ge.ch/musinfo/bd/cjb/africa/>. Cultivation and Propagation: Crassula expansa loves heat and is easy to root and grow. It thrive with bright light and ample airflow. The leaves on this succulent can either appear as bright apple green or flaming red. It makes a nice groundcover in subtropical climates and is drought tolerant and only want light watering. This plant is almost indestructible, does not require any care... no care at all, it will grow. Sure it like water, but it is very drought tolerant... ... throw it on the trash piles and it just keeps growing and flowering, it looses easily its leaves that will root and grow new plants everywhere. Growth rate: Moderately fast (bordering on invasive!) plant for the garden. Repotting: Repot every two years in spring. Do not radically cut off roots: about 10 percent of the root ball is right. Fertilization: Feed it from mid spring to early autumn every four or five weeks with a fertilizer specifically formulated for cactus and succulents (poor in nitrogen), including all micro nutrients and trace elements diluted to ½ the strength recommended on the label. Do not feed plants during winter. Watering Needs: It is a dry-tolerant plant. Water regularly in the growing season, but avoid water-logging and let dry between waterings. Water with caution in winter, as the plant can lose its roots if the soil stays cold and wet for extended periods. The lower the temperature the less water is needed. If grown in a container, bottom watering by immersing the container is recommended. Mist spraying is not needed, it must have very dry atmosphere. Sun Exposure: Does well in filtered sun, but can handle some shade, too. In shade the leaves colour will remain more green, while in harsh full sun conditions the foliage can develop a pinkish tinge. In summer keep cool and provide some shelter from direct sun during the hottest hours. It can be sunburned if moved from shade/greenhouse into full sun too quickly. It tends to get leggy in deep shade. Frost Tolerance: Protect from frost to prevent scarring. It requires a minimum temperature of about 5°C, but will take a light frost and is hardy down to -5° C for short periods if it is in dry soil. USDA zones 9A – 11. In areas prone to frost, grow in an intermediate greenhouse or conservatory, in pots. The plant may be kept indoors throughout the year at a minimum winter temperature of 10°C not exceeding 18°C. In summer, the temperature will rise higher, but as this is accompanied by better light it does not matter. In colder climates plant this in a container, so it can be moved into a protected area when cold. Garden uses: They make wonderful rocker plants in hot, dry areas and also grow well in containers or luminous patios. These crassula plants are great for hanging baskets too. Pests and diseases: May be susceptible to mealybugs and rarely scale. Protect from cold. Occasionally suffers from foliage edema which is thought to be the result of rapid changes in available moisture. Maintenance: At the end of summer plants get quite long-shanked with dried flowering stalk and so is a good time of year to trim them back substantially. Propagation: From seed but it is easily increased by cuttings. Cuttings root easily. It is also possible, to plant the leaves in good, sandy soil where they will take root - members of this family often propagate vegetatively in this way. Take leaf cuttings in spring and summer. Detach a leaf from an established plant by pulling or bending, and leave it to dry for a day. Insert the broken end of the leaf into a mix of one part slightly moist peat and two parts sharp sand Firm the mix around the bases of each cut-ting, which will later grow roots. The leaf cutting can then be repotted.